The auction room is the most common way Sotheby’s Australia assists with the buying and selling objects of value, including art, decorative arts and jewellery. Buying at auction provides the buyer the opportunity to peruse a variety of objects for sale at one time with an exhibition over a few days preceding the sale day. Specialists are on hand to assist with your queries, and each item has an estimated price range to guide you in the value of item. There is a printed catalogue for sale by subscription or purchase at our galleries, or you may review the catalogue online. 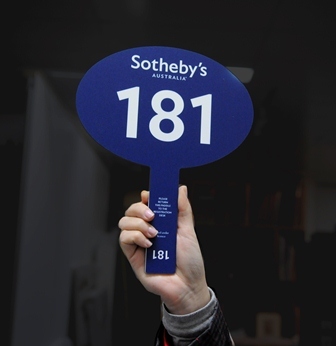 As a seller with Sotheby’s Australia you take advantage of our national and international client database and contacts, and know that through our exhibition and marketing program you will achieve the best possible price in a fair, open and competitive environment. Please visit our section 'buy' and 'sell' which will provide you with more details.